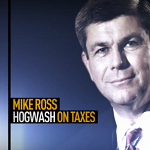 A Republican ad claims Mike Ross, the Democratic candidate for governor of Arkansas, voted “against taxpayers” more than 80 times while a member of the House. We find that number to be inflated. Chris Christie, the Republican nominee in New Jersey’s gubernatorial contest, recently called the candidacy of Chris Daggett, a former Environmental Protection Agency administrator who’s running on the Independent ticket, an "amusement." But the Republican Governors Association isn’t so amused by Daggett.